Mark Shaw hopes today’s return to winning ways will quiet some of Worksop Town’s doubters. 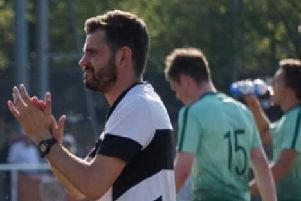 The manager, who has spoken out against some of the criticism his side have received of late, watched Tigers end their losing streak with a 5-1 win over Armthorpe. There were a number of positives, including a brace for Connor Brunt on his home debut and a pair of assists for late stand-in at right-back Jack Hawkins. Shaw was most pleased with the three points and the overall performance. “I think we were a lot better last week and it was a lot better today,” he said. “It could have been a lot worse for Armthorpe if we’d scored the penalty after four minutes. “That kind of performance is where we were last season. “It’s not going to stop all the people who don’t agree with what we’re doing but it was much needed, it’s a much needed result. Worksop didn’t have it all their own way, Armthorpe giving them plenty of problems in the first 20 minutes before the hosts’ superiority showed. “I think their formation was a problem for us, their 4-3-3 against our three at the back,” he said. “But we created that many chances first half I felt quite comfortable. Hawkins was due to be on the bench before an injury to Jordan Hodder in the warm-up. The manager praised the midfielder for the way he acquitted himself at right wing-back. “Jack hasn’t been training all week and asked if he was in the squad yesterday and I told him he was a valuable member of the squad and today he showed just how valuable,” said Shaw. “He had an outstanding game, if he played like that every week I’d pick him every week. “I’ve got to give a lot of credit to him, he’s not played for a while, he’s exhausted now but he’s helped us, done the right things and kicked on other people’s performances. And after a shaky start, missing a fourth-minute penalty, Brunt came good with two fine headed goals. Shaw said: “We have a striker who scores from crosses and looks to take things on early. “His relationship with whoever he plays with will become stronger. “People say I can’t get players in, we can get players in it’s just difficult to get the players in that we want to help us improve.